These cufflinks are made of authentic copper recovered during the restoration Wright’s Graycliff estate. Wear a piece of art history on your sleeve with these charming cufflinks. Made from actual material from the Isabelle R. Martin House, one of three iconic Frank Lloyd Wright buildings at Graycliff estate, they're a stylish way to pay tribute to the legacy of Wright's work. Each set contains copper recovered during the restoration of Graycliff, one of the most extensive summer estates ever designed by the renowned architect. Often called "The Jewel of the Lake" for its place overlooking Lake Erie near Buffalo, New York, Graycliff is known for its organic beauty and sweeping scenic views. 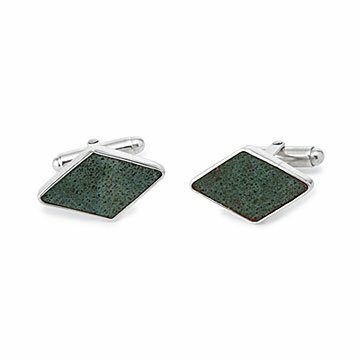 A fitting symbol for Wright's knack for blending high design and the natural world, the reclaimed copper within these cufflinks contains a rich patina, a detail any architecture buff is sure to love. Made in New York.